Do You Know About the Digital Archives? Earlier this week, someone contacted me to ask whether an article from a past issue of Brethren in Christ History and Life (our journal) is available in digital format. This person is a member of the Historical Society and “likes” our Facebook page, but was unaware of two of our newer resources: this website and the Brethren in Christ Church digital archives. I was happy to help him, but his question made me realize that others may also not be aware of these resources. So here’s the information with instructions. 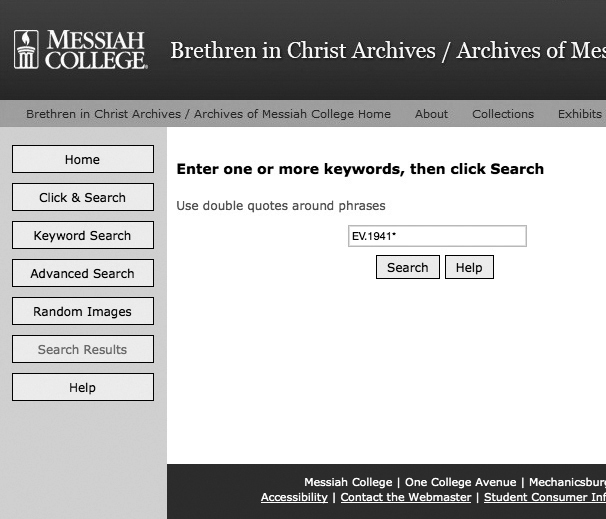 In addition to the resources Glen names, the digital archives also includes all issues of the Historical Society’s journal, Brethren in Christ History and Life, through 2011. Here are detailed instructions for how to access the digital archives (scroll down to article entitled, “Archives Resources Now Online”). Another resource is the index for the journal, available on our website. The index is complete from the journal’s inception in 1978 to the end of 2012. While it has limited functionality because of its format and the way it is organized, it is a helpful tool for finding out whether any articles have been written by a specific person, or about a person or topic (assuming the topic appears in the title of the article). You can search the PDF document by using the “Find” function on your computer (Ctrl-F for PCs, and Command-F for Macs). Once you have determined what issue your topic or person of interest appeared in, you can then go back to the digital archives to search for the issue and the article and download a PDF copy. Finally, if you are a member of the Historical Society (membership involves paying annual dues to help support our activities), you can access complete issues of the journal on the Journal page of our website, starting with the August 2012 issue. Members will need to register for an online account; non-members are invited to join the Historical Society, with one of the benefits being able to access complete issues of the journal. Click on Membership at the top of the page for instructions. Making more content available digitally and online is an ongoing goal of both the Historical Society and the Brethren in Christ Archives. Another goal is to create a much more functional topical index to the journal, but as you can imagine, that is a big job! If you can’t find what you’re looking for, please feel free to contact me.